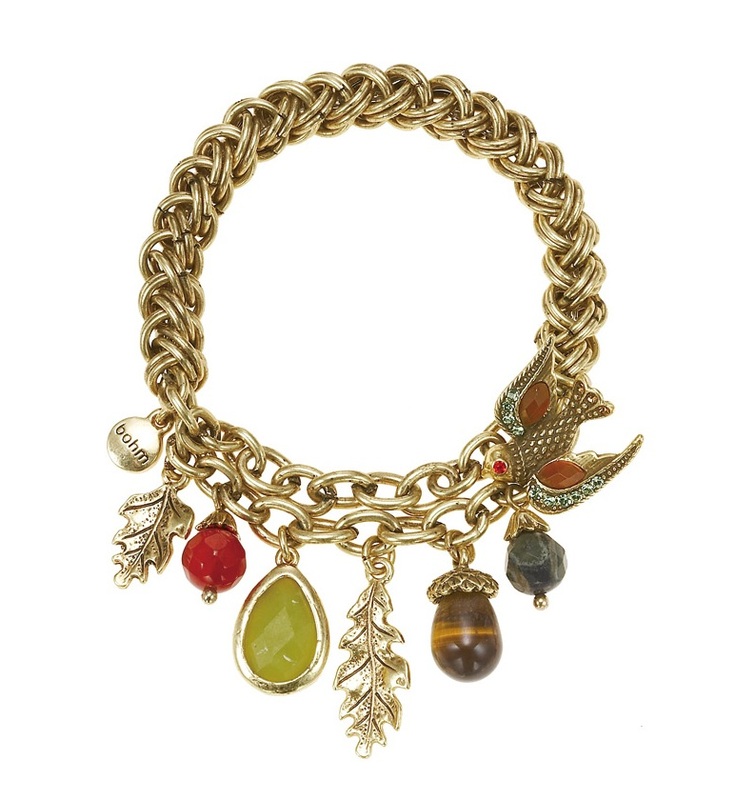 Autumn ray is a delightful series in gold plate with cast oak leaves and birds and a wonderful mix of semi-precious stones: shimmering gold and brown tiger eye, picture jasper, meshy stone, olive jade, red agate, ernite and various Swarovski crystals. 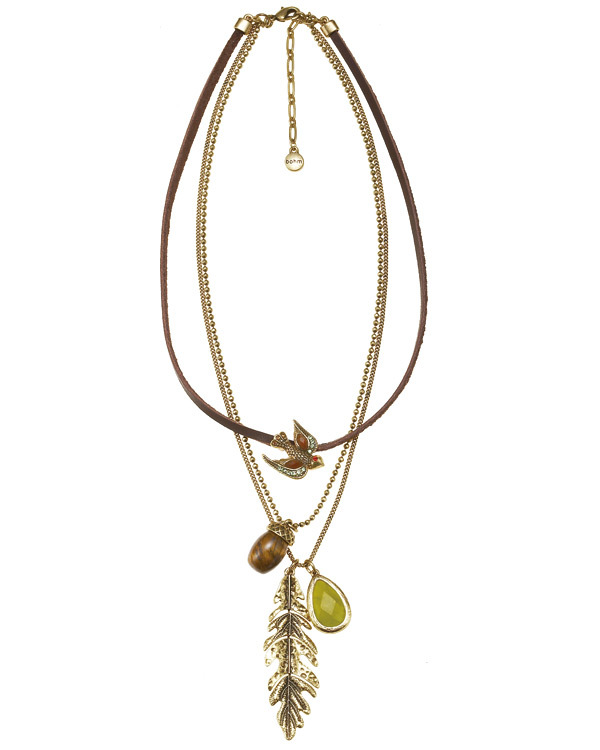 Multi-strand necklace with oak leaf, faceted drop, bird and acorn motifs. The various charms measure 2cm/20mm upto 5.5cm/55mm. Swarovski crystals and semi-precious stones. The chains are all different lengths so it falls in a layers. length 16.5 inches/42cm to an adjustable 18.5 inches/47cm. 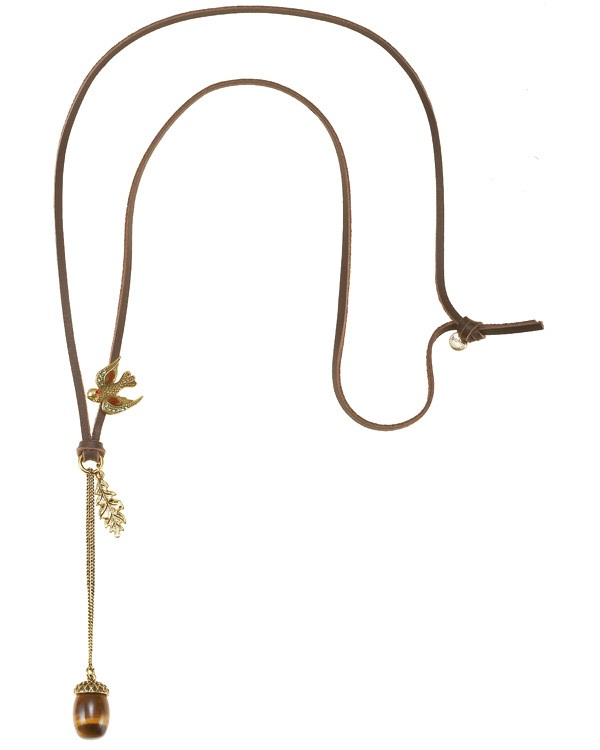 Leather cord necklace (3mm) with oak leaf, bird and acorn motifs. The various charms measure approx. 2cm/20mm. Swarovski crystals and semi-precious stones. Length 32 inches/81cm, can be worn shorter. 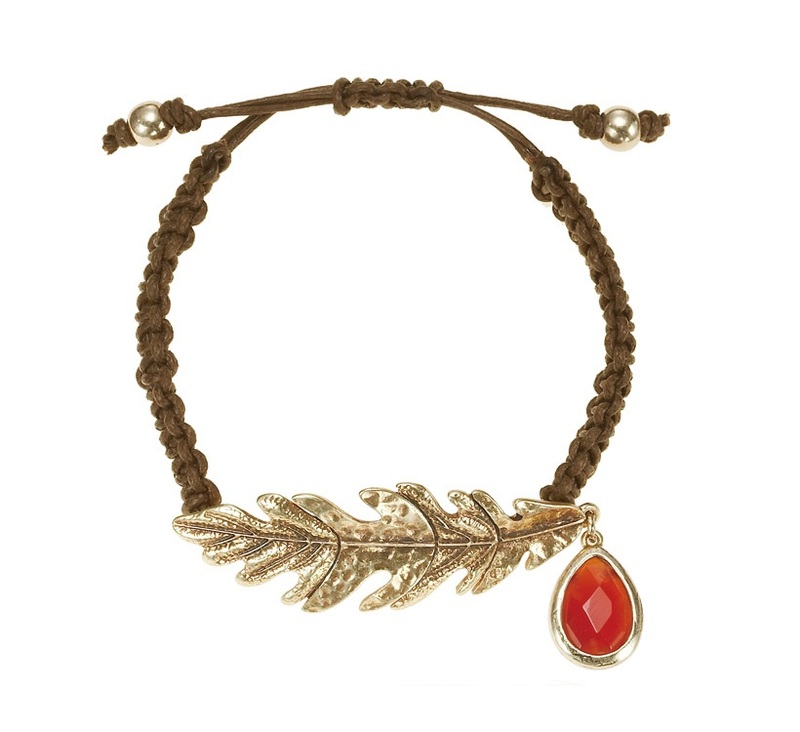 Outstanding bracelet, with various charms: oak leaves, faceted semi-precious drops, bird and acorn. The various charms measure upto 2cm/20mm. The back section a complex linked mesh that stretches to accommodate the wrist. Un-stretched the inner circumference measures 6.25 inches/16cm. Adjustable braided bracelet (1cm/10mm wide) with chinese knot closure. 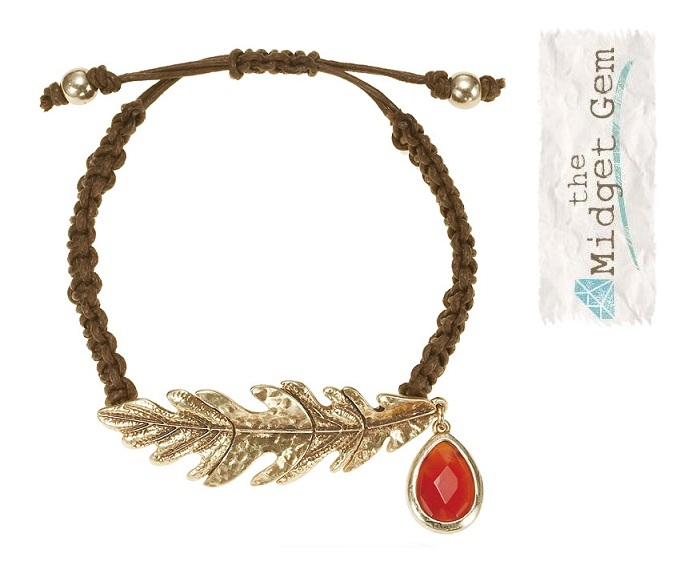 The focal is a cast oak leaf (6cm/60mm x 2cm/20mm) with red agate faceted drop (2cm/20mm). 16cm/6.25 inches upto 22cm/9 inches. Waxed cotton cords in chocolate brown. 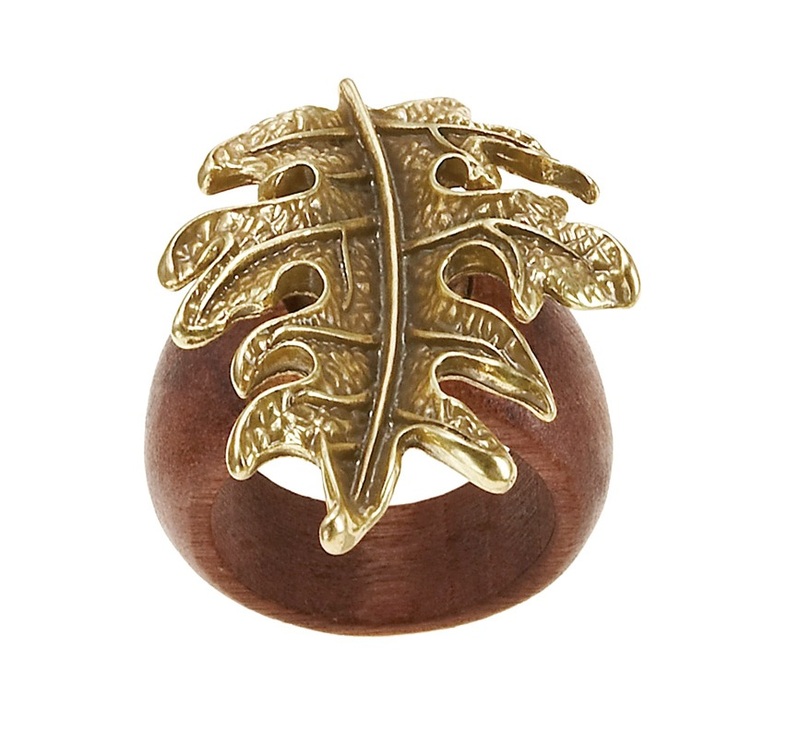 Beautiful ring, with the naturalistic mix of wood with a finely cast oak leaf. The ring shank is 1.2cm/12mm wide and tapers slightly towards the back. The leaf measures 3.5cm/35mm x 2.5cm/25mm wide. 3 sizes available. 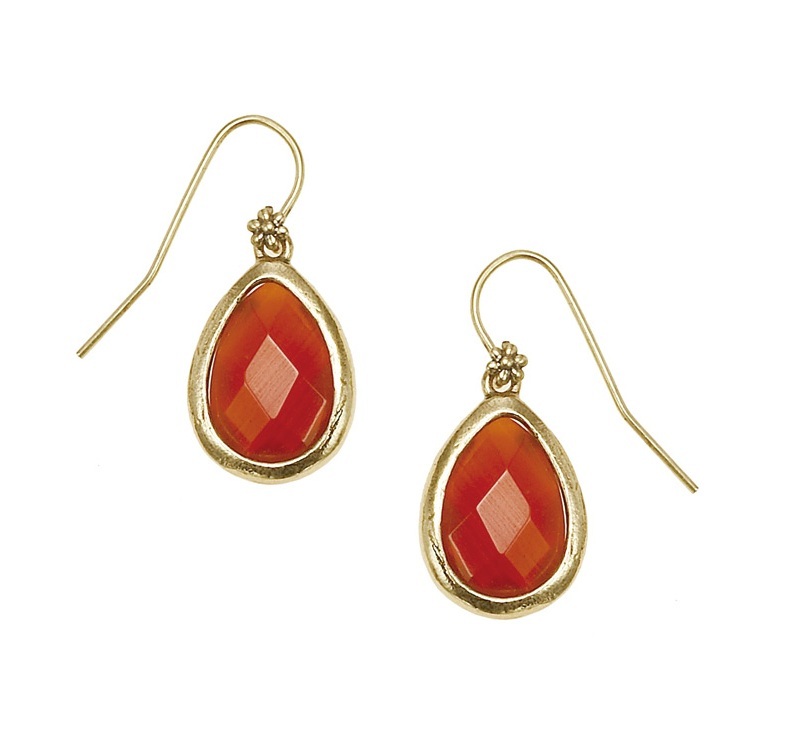 Simple faceted drops of red agate within golded frames form these simple and sophisticated dangly earrings. Drops measure 1.5cm/15mm x 1.2cm/12mm, total length 3cm/30mm. Hook fastener for pierced ears. 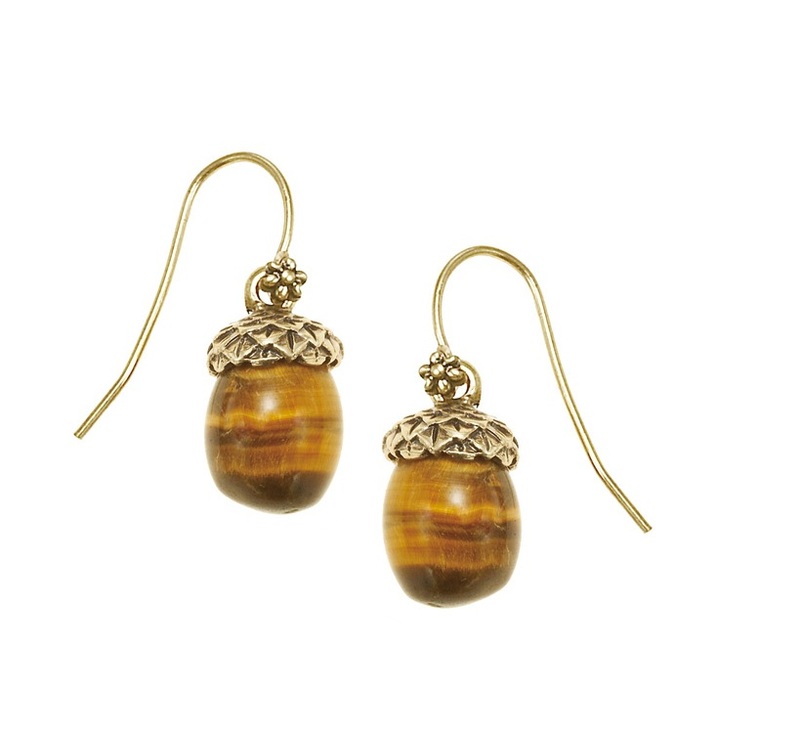 Really cute acorn earrings, with shimmering tiger-eye semi-precious stones sitting neatly in cast metal cups. The acorns measure 1.5cm/15mm x 9mm, total length 2.6cm/26mm. Hook fastener for pierced ears.